Just as Ahab was fixated on finding the white whale, I am fixated on winter’s arrival. Buffalo, New York was clobbered with snow. Dorothy has a photo of a dusting of snow in our front yard and my Hoosier friends Bill and Mark have winter photos on their Facebook pages. However, if you are an angler who likes to fish moving water, the fishing is not yet over. On the East Coast, Russ Drumm suggests, in his weekly outdoors column in The East Hampton Star, that the striped bass migration has not reached Long Island, it is somewhere near Cape Cod. On the “North Coast,” steelhead and salmon are fair games as they ascend Great Lakes tributaries. 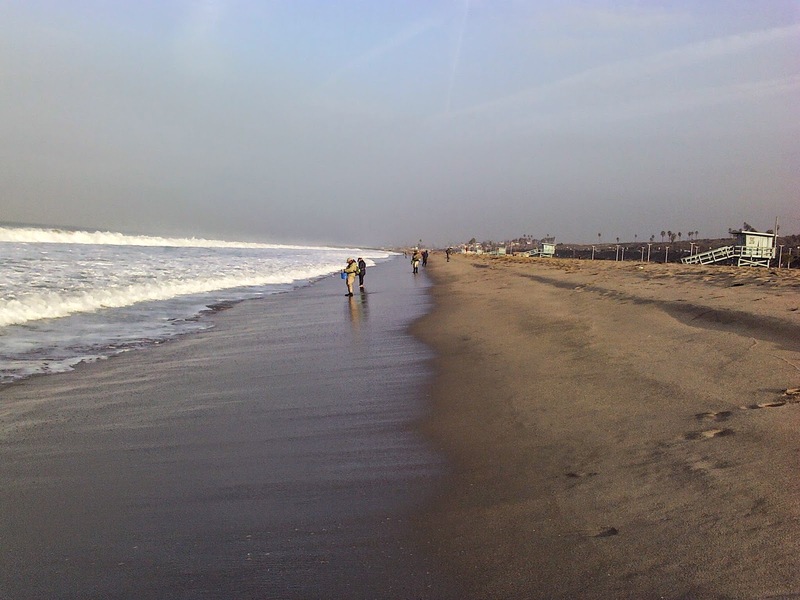 On the West Coast, a bouillabaisse of fish species are within casting distance of the beach. The fish include surf perch, corbina, halibut, sharks and even stripers. 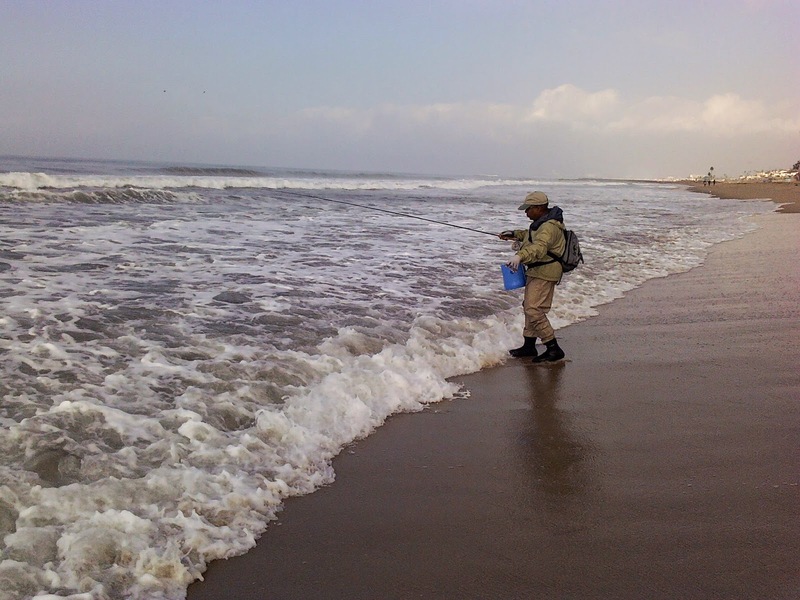 This past Saturday, I joined the Pasadena Casting Club for saltwater fly fishing at Dockweiler State Beach, just west of Los Angeles International Airport. With a string of informative and congenial e-mails, Carl Crawford, the trip organizer persuaded over 20 anglers to show up - - despite the dark and an early morning start time. Waves and undertow add challenges to saltwater fly fishing. Jacob Gorman and Nick Vargas, avid anglers and sales managers at Orvis Pasadena, fished with us and offered good advice, often using examples that related freshwater fishing to the maelstrom of surf in front of us. Jacob and Nick taught us how to read the progression of waves to find the right time to cast: too soon and there is bare sand; too late and the wave is sweeping away the fly. Compared to a trout stream, surf looks featureless. But Jacob and Nick taught us how to see places where fish might shelter from the current and pounding waves. For example, if you keep seeing a low spot in a line of breakers, the low spot suggests a deeper spot that might hold fish. It’s a good idea to fish the surf with a shooting head sink-tip fly line. The first 30 feet, the shooting head, pulls a light, strong running line off the reel. The combination of lines allows a longer cast than is possible with a fly line alone. A casting basket is essential. It keeps the line from falling into the surf and tangling. The deeper the basket you can find, the better. The Santa Cruz Fly Fishers sell a casting basket for a donation of $20 plus shipping; their design or something similar will save much frustration. In four hours, the expedition caught a single fish. While we climbed the salt water fly fishing learning curve, a quiet young man with a spinning rod and Mepp’s spinner caught four surf perch. Yet, all were delighted by the trip. We learned how to time our casts with the waves. We practiced how to rapidly retrieve, or strip, the fly line to animate the fly and most had surprisingly few times when the fly line tangled up. Carl, Jacob, Nick and angling friends new and old: it was a great trip. Let’s go again!